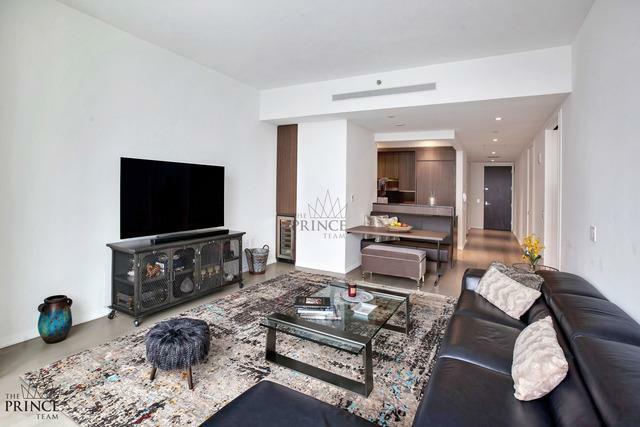 Welcome to Downtown luxury in this gorgeous one-bedroom, one-bathroom residence in a highly sought-after modern, full-service Financial District condominium.Spanning a full 1,080 square feet, this opulent home features expansive living spaces and lovely views of the New York Harbor. A wall of south-facing windows provides a fantastic backdrop to daily living in the large great room, where wide-oak paves the floors, 10-foot-tall ceilings soar overhead, and the built-in banquette and wine fridge accommodate effortless entertaining and relaxation. The open chef's kitchen is a sleek and subdued masterpiece filled with custom walnut cabinetry, granite countertops, and top-of-the-line stainless steel and integrated appliances by Sub-Zero and Miele, including a dishwasher, fully vented gas cooktop and built-in microwave. 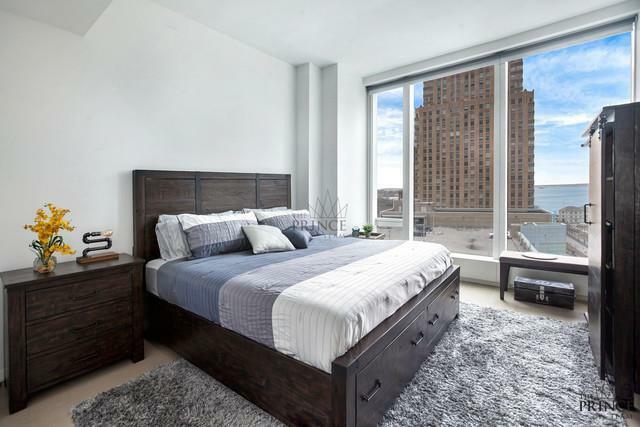 Wake up to more iconic views in the large master bedroom where you'll enjoy a large dressing area and walk-in closet. 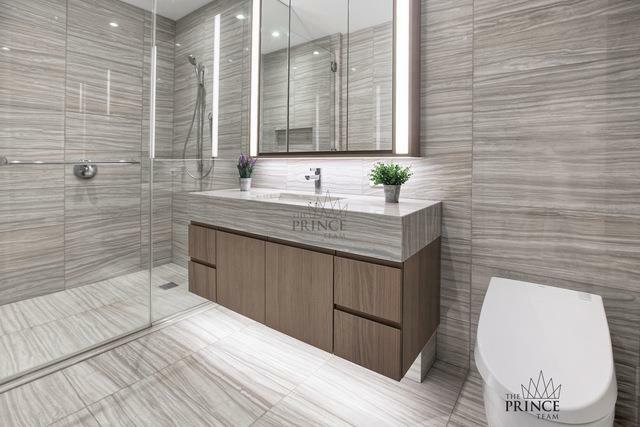 Floor-to-ceiling marble sets a lavish tone in the en suite bathroom featuring an oversized walk-in rain shower, wide vanity and lighted mirror, an electronic Toto toilet with built-in bidet, and radiant floor heating. 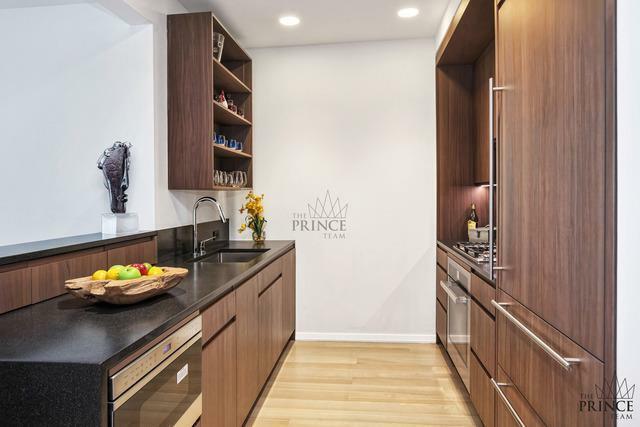 Additional closet space and an in-unit Whirlpool washer-dryer ensure total convenience in this spectacular FiDi showplace. 50 West Street is a new luxury condominium from renowned architect Helmut Jahn and interior designer Thomas Juul-Hansen. This fantastic addition to the Financial District landscape offers 24-hour doorman and concierge service and four full floors of amenities, including a large fitness center with a golf simulator and indoor cycling studio, spa treatment rooms, children and teen recreation spaces, screening room, a water club with 60-foot swimming pool, and a 64th-floor observation deck with aerial views and two outdoor dining areas. Set at the intersection of FiDi and Battery Park City, this beautiful glass tower is surrounded by the best of Downtown living. Westfield World Trade Center and Brookfield Place provide word-class dining and shopping venues, and The Battery offers outstanding waterfront outdoor space and recreation. With 1/2/3, 4/5, R/W and J/Z trains all nearby, the rest of the city is mere minutes away. Listing courtesy of Jackie Soussan of Compass.